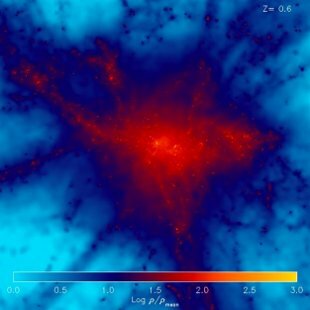 The power of cosmological simulations to trace the development of cosmic structure has grown rapidly over the past 30 years, and state-of-the-art simulations now track well over 109 particles representing dark matter and baryonic material (normal atoms) as they interact via gravity as well as heating, radiating, shocking etc. Including all the necessary physics in simulations is difficult, since complex processes operating on astronomically small scales, such as the formation and evolution of stars, and the growth of supermassive black holes, can have an impact on the structures which develop on much larger scales. 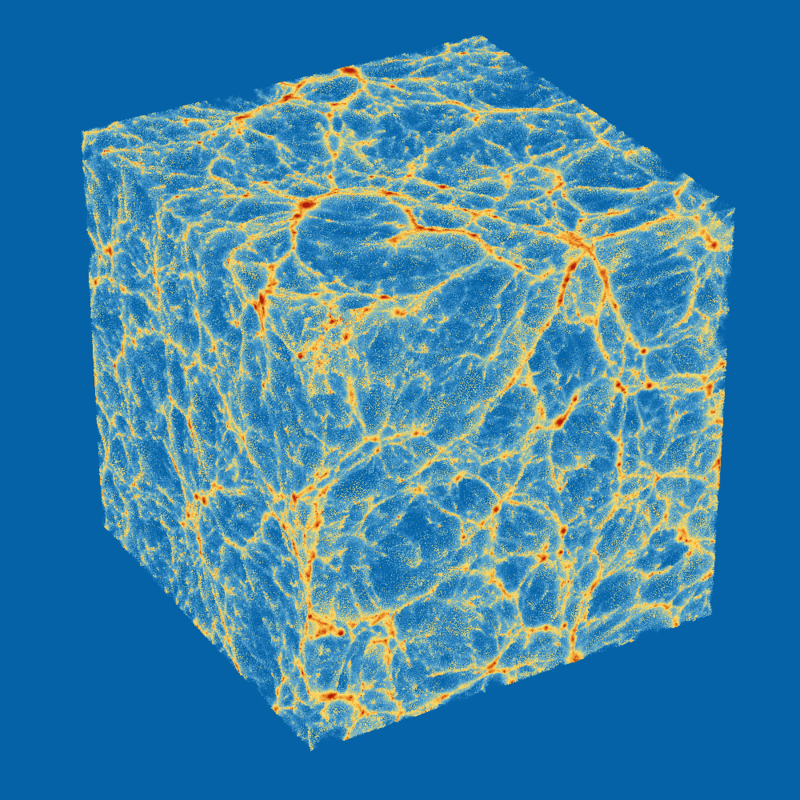 The 100 Mpc cube simulated by the OWLS simulations, showing the large scale filamentary structure which develops by the present day. Simulations help us to interpret observations, and to allow for the observational biases which are almost always present. Observations help to test the predictions from simulations, and hence to improve their treatment of complex physical processes. 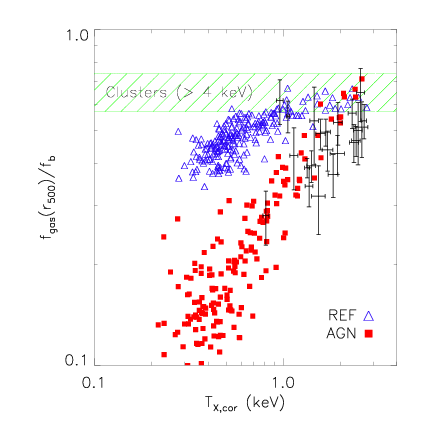 Energetic feedback from AGN appears to be required to match the observed properties of galaxy groups at low redshift. The evolution of group properties should lead to even tighter constraints on models. Simulations are needed to enable us to allow for the "selection effects" in surveys of groups and clusters, so we can understand which systems we fail to detect. Simulations can also help us to understand the systematic errors which enter into our programme for estimating cluster masses using a variety of techniques. Left - a galaxy group in the OWLS simulations. Right - the fraction of hot gas in a set of simulated groups is plotted against the mean gas temperature (hotter gas implies a more massive group) for two differemt sets of simulations. The REF model contains star formation and supernova explosions, but no supermassive black holes. The AGN model also has energy injection from Active Galactic Nuclei, which host giant black holes. The latter model provides a much better to the low gas fractions seen (black crosses) in observed groups.